NYC, 04/30/2019, 5:30PM. Everything Belongs to Us. 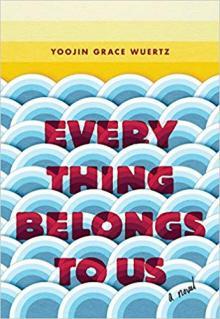 Professor and author Yoojin Grace Wuertz discusses her book, Everything Belongs to Us. "Two young women of vastly different means each struggle to find her own way during the darkest hours of South Korea’s “economic miracle” in a striking debut novel for readers of Anthony Marra and Chimamanda Ngozie Adichie" (Everything Belongs to Us). "Seoul, 1978. At South Korea’s top university, the nation’s best and brightest compete to join the professional elite of an authoritarian regime. Success could lead to a life of rarefied privilege and wealth; failure means being left irrevocably behind" (Everything Belongs to Us). “The intertwined lives of South Korean university students provide intimacy to a rich and descriptive portrait of the country during the period of authoritarian industrialization in the late 1970s. Wuertz’s debut novel is a Gatsby-esque takedown, full of memorable characters.”—The New York Times Book Review (Editors’ Choice).